All of the $ 40.00 goes to rice. There are no other costs. A bag of rice is 550 meals. 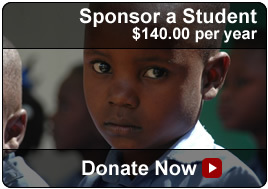 In Cap Haitian the EBAC Orphanage uses 8 bags of rice a month to feed 80 orphans and the staff and teachers. In Haiti Rice is Life - help us "Buy a Bag". For only $140.00 a year, you can feed a child throughout the school year and summer in Hearts for the Hungry sponsored programs. Can your church or organization adopt an entire school? There are schools of all sizes in Haiti, from 50 students to 500. With our Adopt-A-School program you will be able to send and receive correspondence from the school, and build a relationship with the teachers and children of that school.